The next day, the main session was hosted by Paula Zahn – complete with full Twitter disclosure – and headed off by powerful female executives of Safeway (Larree Renda) and Disney Media Networks (Anne Sweeney). Geena Davis, who created The Geena Davis Institute on Gender in Media, also spoke on the inequality of female characters starting as early as G-rated features. 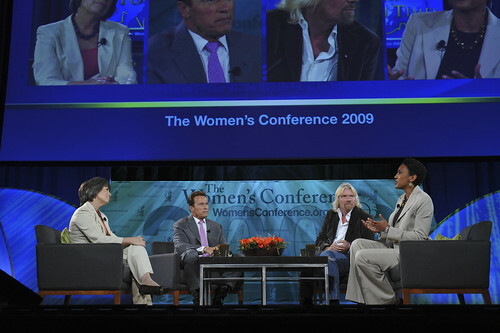 The featured conversation, though, was with Sheila Bair – chairwoman of the FDIC, Arnold Schwarzenegger – Governator of California, Sir Richard Branson – Chairman of the Virgin Group and moderated by Robin Roberts – co-anchor of Good Morning America. Dispersed in between the main sessions, there were two panel discussion sessions and a handful of options to choose from for each session. Naturally, I chose “Changing the World Through the Web.” Kara Swisher, co-producer and co-host of The Wall Street Journal’s All Things Digital, moderated the conversation between Joe Rospars (new media director for the Obama Presidential campaign), Randi Zuckerberg (manages marketing initiatives at Facebook, sister of co-founder Mark Z. 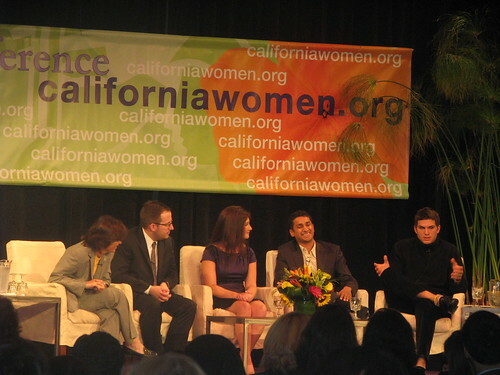 ), Premal Shah (creator of Kiva.org) and Ashton Kutcher (needs no explanation here). The discussion was kicked off by a screening of a Jon Stewart Daily Show clip making fun of Twitter. The exchange that evolved focused on how the Obama campaign utilized user-generated content (gathering for parties and canvassing efforts), how Kiva has been able to provide microloans for entrepreneurs in Third World countries and plenty of jabs taken at Ashton Kutcher by moderator Kara Swisher. 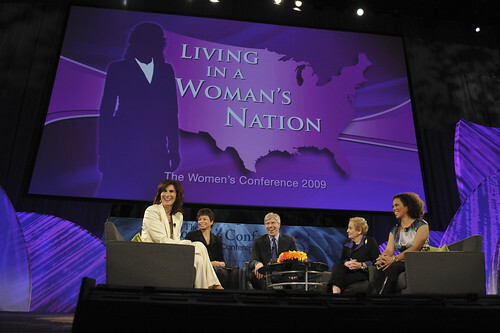 The next main session featured a conversation between Claire Shipman (Good Morning America), Valerie Jarrett (Sr. Advisor to Obama), Madeline Albright (frmr Secretary of State) and Amy Holmes (CNN) – and moderated by David Gregory (Meet the Press). Main points addressed the evolving game for women in a man’s world – including the responsibilities and desires for family time and the negotiation of such with male partners. In regards to advancement, Valerie Jarrett advises, “Be your own best advocate” whereas Madeline Albright encourages a little finesse: “Women don’t have to hate men to get ahead. It’s not a battle anymore. It’s a partnership,” as well as sisterhood: “There’s a place in hell reserved for women who don’t help each other” (in regards to women who work vs. women who stay at home). 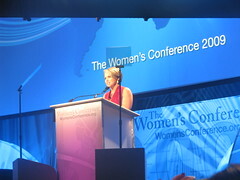 Katie Couric came up next and gave her story on failure and resilience. She told of her start – with the President of CNN at the time saying he “never wanted to see [Katie’s] face again” on TV to demanding the same hard-hitting stories as her male co-ancher (Bryant Gumbel) on The Today Show before she took the job. 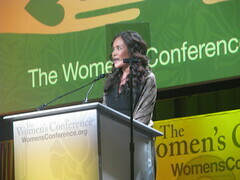 It was an awe-inspiring speech and challenged everyone in the room to think differently about the permanence of failure. The next pertinent conversation in the main arena was a mind-blowing panel on grieving. It was opened byÂ Maria Shriver and the story of herÂ days Â the testimony of the last living days of her mother, Eunice Shriver.Â a true testimony in the realities of a necessary process that often goes unrealized – the reality being that it catches up to you, eventually. 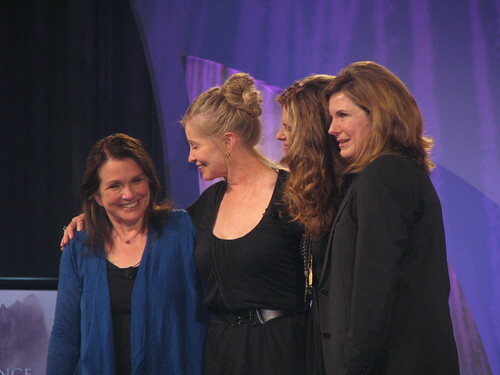 Presenting on the panel was Elizabeth Edwards, Maria Shriver, Lisa Niemi (Patrick Swayze’s widow) and Susan Saint James. It was definitely a courageous panel – and one that everyone learned Kelly Preston (John Travolta’s wife, Jett Travolta’s mother)Â had considered participating in but decided, understandably, it would haveÂ been too hard. The discussion brought to light the necessity of the grief stage and how “no one is exempt” while understanding that real bravery is going through this realization and subsequently doing the hard, unpredictableÂ work. The Women’s Conference – Â is worth the time out to hear noteable, even powerhouseÂ speakers present the state of women today. 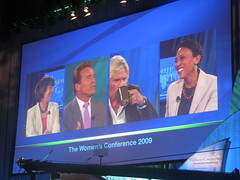 This entry was posted in Events, Femme, Long Beach and tagged @thewomensconf, Amy Holmes, Ashton Kutcher, Claire Shipman, David Gregory, Joe Rospars, Kara Swisher, Katie Couric, Kiva, Lean Cuisine, Long Beach Convention Center, Madeline Albright, Martha Beck, Paula Deen, Paula Zahn, Premal Shah, Randi Zuckerberg, Robin Roberts, Schwarzenegger, Sheila Bair, Sir Richard Branson, Somaly Mam, Valerie Barrett, WC09, Women's Conference. Bookmark the permalink.